As you inspect green onions you may come across discolored tops, watersoaked tops or even decay. But you may come come across insect damage, usually seen affecting the tops. Seen above in this image, this insect damage is caused by a leafminer, insects that feed on leaves of many vegetables. The adult insect is a winged insect, but the larvae is what causes this damage. The winding paths or trails are the result of feeding and characteristic of this insect. Identifying this defect is pretty easy, but determining if the insect damage is severe enough to be scored as a defect is not so easy. Let’s take a look at the U.S. Grade Standards for Green Onions. The standard was originally published in 1947, and surprisingly contains the same language today, some 65 years later. The requirements for U.S. No. 1 state the green onions must be free from damage caused by insects. That’s it. Nothing more is mentioned about insect damage, specifically,the amount allowed (scoring guidelines). The general definition of damage would be applied in this case, meaning if the insect damage is severe enough to materially affect the appearance of the individual onion. The key point in the scoring definition is “if it materially affects the appearance of the individual onion”, not the appearance of the bunch. For example, taking a look at the above image you can clearly see the insect damage caused by the leafminer. You can see the damage on the one onion for sure, and possibly on another onion or two. 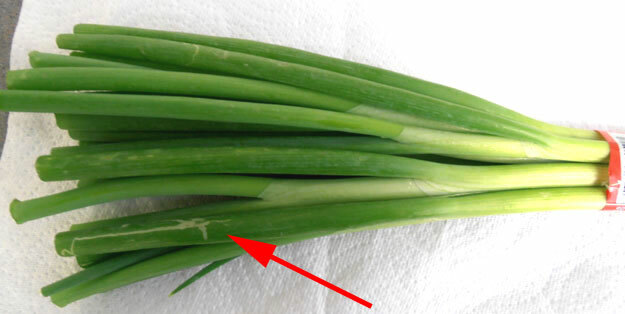 If you picked up this bunch of green onions you may not even notice the insect scarring, and would not even think about it being a defect. But for green onions you are inspecting the individual onions, not the bunch as a whole. When inspecting green onions you would separate the onions, counting out 50 individual onions, and pull out any defective onions, such as the one shown above. If you find three individual onions with insect damage, out of a 50 count sample, you would have 6% damage by insect damage for that sample.